Which of the following is equivalent to average total cost? a)Fixed cost plus variable cost. b)Fixed cost and variable cost added together and then divided by output. c)The change in total cost divided by the change in output. d)Marginal cost plus variable cost. When producing jeans, which of the following are not a variable cost in the short run? In the short run, when output is zero, total costs are zero. c)Land, labor, capital, and entrepreneurship. d)Output in a production function. a)The equilibrium price in a specific market. b)The level of government regulation in a specific market. c)Whether or not a firm is able to alter its output. d)The number and relative size of firms in an industry. a)Decides whether to enter or exit the market. b)Makes a long-run decision about output and revenues. c)Decides whether to buy or lease new plant and equipment. d)Decides the short-run rate of output. a)Each firm will supply less output at any given price. c)The marginal cost curve shifts downward. Which of the following market structures has the highest barriers to entry? If a perfectly competitive firm produces and sells more output, its _______ will definitely increase. a)Consumers want resources to be reallocated. b)The barriers to entry are too high. c)Additional firms will enter the market. d)More of the product should be produced. An oligopolist may decide to coordinate with others in the industry in order to maximize profits. Which of the following is not consistent with a monopoly industry? a)Production and supplies are constrained. b)Barriers to entry keep potential competitors out of the market. c)There is no pressure to reduce costs or improve product quality. d)Many firms produce identical or similar products. 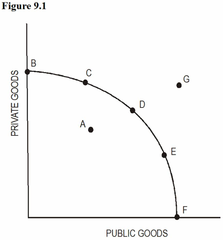 a)C because the market mechanism tends to under produces public goods. b)E because the market mechanism tends to under produces private goods. c)D because the market mechanism is efficient. d)A because full employment can never be reached. a)Buyers do not have complete information about the product. b)Producers have too much power. c)Third parties bears the costs or benefits of a market activity. d)Goods and services are not distributed fairly. Income transfers are a government response to the market’s failure to provide an equitable distribution of goods. b)Slopes upward to the right. c)Is the same as the market demand curve. d)Is the same as the marginal revenue curve. a)Is any good produced by the government. b)Has social costs that are lower than private costs. c)Is provided in an optimal amount by the market. d)Cannot be denied to consumers who do not pay. Which of the following statements concerning the relationship between total product (TP) and marginal physical product (MPP) is not correct? a)TP will continue to rise even though MPP is falling but greater than zero. b)TP is increasing at an increasing rate if MPP is increasing. c)TP will fall if MPP is negative. d)TP will fall if MPP is falling. a)Return on stocks and bonds diminish as more are purchased. b)Addition to total utility declines as more units are consumed. c)Marginal physical product of a variable input declines as more of it is used. d)Output of any good or service increases as more variable input is used. Which of the following will always increase as output increases? a)The marginal product of all four workers is 14.
b)The total product of two workers is 42.
c)That after the second worker marginal product declines. d)That adding a forth worker will cause total product to decline. a)Sum of total revenue and total costs is high. b)Difference between its total revenue and total costs is negative. c)Difference between its total revenue and total costs is positive. d)Total costs and marginal costs are low. b)where economic profits are negative. c)at a point where firms will leave the market. d)where economic profits are positive. Which of the following is characteristic of a perfectly competitive market? a)Can sell all of its output at the prevailing price. c)Can sell some output at a price above the market price. 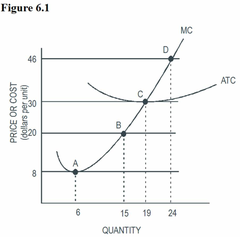 d)Can sell more output only if it reduces its price. b)The same as the demand curve faced by the firm. a)Are the additional costs incurred in producing one more unit of output. b)Fall as the rate of output increases. c)Are constant for a perfectly competitive firm. d)Are equal to total costs divided by total output. A profit-maximizing competitive firm wants to _____ the rate of output when price _____ marginal cost. Economies of scale occur when the long-run average cost curve slopes downward. In monopolistic competition there is more price-setting power than in perfect competition. d)Between 3 and 4 units. Which of the following is most likely a private good? a)The inequitable distribution of output. b)All costs and benefits of a market activity borne by a third party. c)The impact that imported goods have on domestic markets. d)Free-riders who benefit but do not pay. a)Nonpayers can be prevented from consuming it. b)It can be enjoyed exclusively by free riders. c)The market is likely to produce too little of it. d)It is provided most efficiently by government. a)Leads the economy to a point beyond the production possibilities curve. 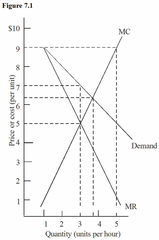 b)Leads the economy to an undesirable point on the production possibilities curve. c)Is superior to government intervention. a)Always fixes macroeconomic market failures. b)Always fixes microeconomic market failures. c)Always makes the economy worse off. d)May fix market failures or make the economy worse off. a)The average cost curve will shift downward. b)The profit-maximizing level of output will be increased. c)The marginal cost curve will shift downward. One News Wire article in the text carries the headline “Forced Recycling Is a Waste.” If the city forces people to recycle, which type of market failure is it attempting to correct?